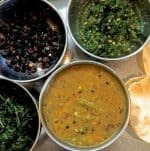 There’s nothing better than a simple easy poriyal or dry curry to accompany sambar and rice, along with fried appalams, of course, and is my favourite meal combination. 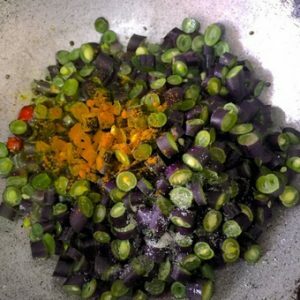 This recipe is for one such poriyal, a purple beans curry. 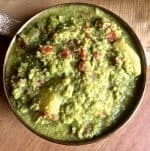 This poriyal was interesting to make as I had some fresh purple beans from First Agro Farms who supply us lucky residents of Bangalore, with fresh, zero pesticide, non GMO vegetables and greens. These beans look gorgeous! When you slice them, they are a bright green within and contrast so well with the purple skin. 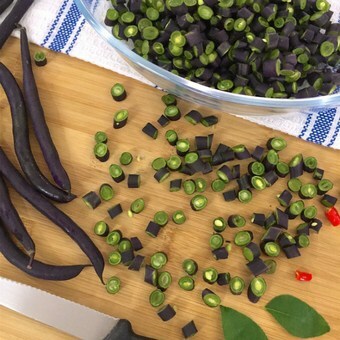 Of course, like most purple vegetables and herbs, once the beans feel the heat while cooking, they quickly turn a dull green, just like your regular green beans. But it was fun while it lasted! I find the purple beans to be sweeter than green beans, maybe even a little earthier. Perhaps that is because I cook them for as less a time as possible, taking them off the stove as soon as the beans are done, or perhaps the beans themselves taste better than regular green French beans. 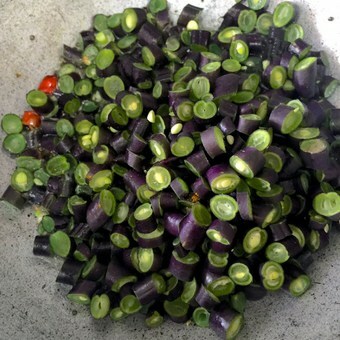 A garnish of fresh grated coconut enhances the flavours of the purple beans curry. Turmeric adds to the flavour and health quotient. 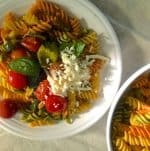 I use sesame oil in this dish, and the nutty taste goes well with the mustard and fenugreek used to temper the curry. Purple vegetables are rich in anthocyanins, which are a type of phytonutrient, or plant compound, said to have potential disease-fighting benefits. Some studies have suggested that anthocyanins could help reduce the risk of heart disease, diabetes and certain types of cancer. There is some indication that these purple pigments might reduce the effects of ageing, on the brain. Beans, even otherwise, are a good source for protein, and little or no fat and are free from cholesterol. 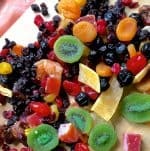 They have a variety of vitamins, minerals and antioxidants. Research suggests that the soluble fibre in beans can help reduce cholesterol and triglyceride levels. Sesame oil, which is extracted from sesame seeds, is known to have been in use since the Indus Valley Civilization. It is said to provide a gamut of health benefits such as for better hair and skin health, aiding in strong bone growth, reducing blood pressure, as well as helping in treatment of anxiety and depression. The oil is said to improve health in infants, improve the digestive process, and reduce inflammation. Studies published in the Yale Journal of Biology and Medicine, say that “Sesame oil as edible oil, lowers blood pressure decreases lipid peroxidation, and increases antioxidant status in hypertensive patients.” It is strong in unsaturated fats, which may help reduce the risk of coronary heart disease. Sesame oil also has the organic compound, phytate, which has been linked by some studies directly to a reduction the development of cancer cells. It is believed that the high levels of magnesium as well as its calcium content, can lead to reduction in the onset of colorectal cancer. Apart from the great nutritional value, this purple beans curry is just easy to make and totally delicious. 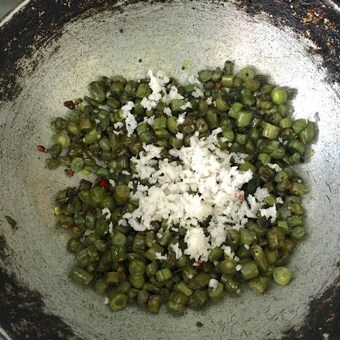 The recipe may be easily used with regular green beans. Note: The purple beans from First Agro Farms were bought and paid for by me, and the use of First Agro’s name in this post is just to express my appreciation for the safe nutritious produce I am able to source from them. Simple, quick curry of french Beans, sautéed in sesame oil, garnished with fresh coconut. 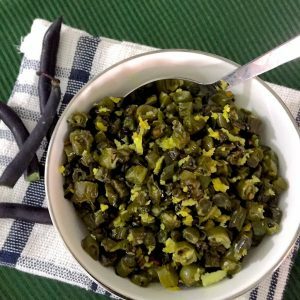 Gorgeous Purple beans which are a bright green when sliced or regular green beans, make for a delicious accompaniment to sambar or rasam and rice. Preparation: Wash the beans. Top and tail the ends, and if there are any strings on the side, peel them off. Slice the beans into small even sized pieces. The smaller the better so they cook fast. Slice the chilli, shred the curry leaves. Heat oil in a pan. 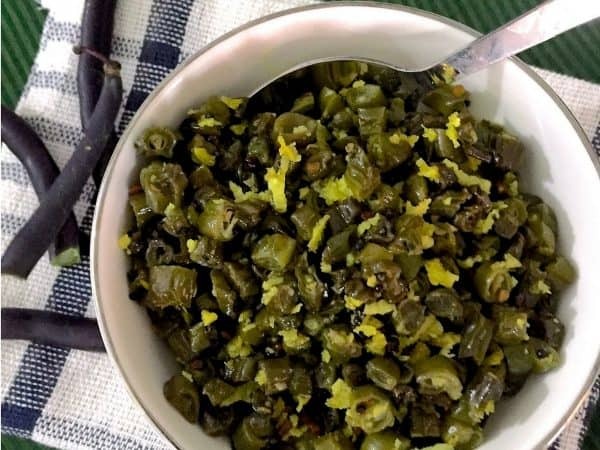 Any cooking oil may be used, however sesame oil gives an authentic flavour to this traditional Tamil Brahmin recipe, and is a healthy oil to use. 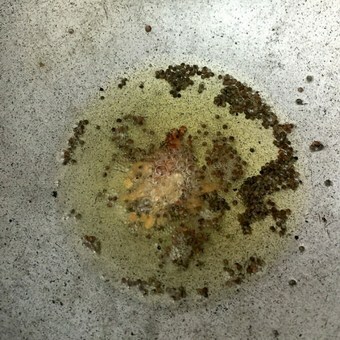 Add the mustard seeds (rai), let them sputter. Add the fenugreek (methi) seeds. Sauté for 10 seconds. 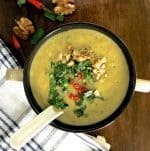 Add the split urad dhal, sauté for 10 seconds. Add the sliced chilli, let them scald in the hot oil. I use fresh red chilli to contrast with the colour of the beans, and so that one doesn't bite into them by mistake! 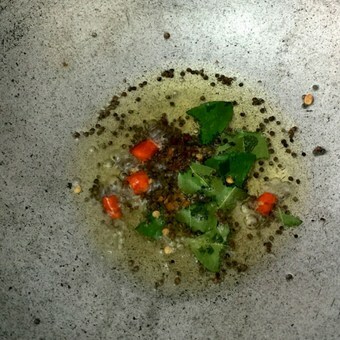 Add the curry leaves. I shred them so that they get eaten instead of being left on the side of the plate as all of us do! Add the sliced beans, stir so that all the ingredients mix. Add turmeric and salt, stir again. Add only a little salt, as the beans would reduce in volume when cooked. You could check the salt again at the end and add if required. Cook, covered, on low flame, for 7-10 minutes, stirring frequently so that the beans do not brown or char. Test for 'doneness' by taking a few slices on a plate, and pressing down with the back of a spoon. When cooked, the beans will immediately get smashed. The beans need to be cooked just till the raw taste disappears. Check the seasoning, add a little more salt if required to your taste, and stir briskly to mix it evenly. Add the grated coconut, stir, and take off from the stove. Transfer immediately to a serving dish, so the beans do not continue to cook in the hot pan. Thank you for taking the effort to try it again, Sundari!